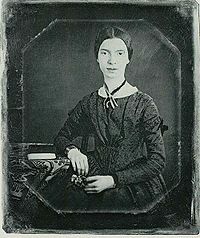 Emily Dickinson (1830 – 1886) is considered a major American poet, though she was not accorded this honor until well after her death, when her younger sister discovered and began to share the enormous body of work that Emily left behind. A recluse who almost always wore white, Emily was born to a prominent Massachusetts family and spent the bulk of her life inside her home in Amherst. Only seven of her poems were published during her lifetime, and virtually none were published as originally written until the mid 1950s. (Emily’s odd punctuation, capitalization, and formatting did not meet with standard publishing “approval” for earlier editions.) There is a whimsical nature to many of her poems, although the subject of death was the most frequent recurring theme. How lovely, lavish in the words not analyzing. These words are worth the picture over and over. What to say! This is one of the very best poems ever by one of the best poets ever about one of the best things in life ever. Thanks for offering it today. It's fun to contrast the poem with the Victoria picture with her bio, which stared at me as I was reading the poem. And Lisa's comment certainly adds to the poem's mystery. No hint of any specifics of the lover, except that they shared passion. As a related comment, it's been said, and I think it's true that Emily and Walt Whitman are every modern American poet's poetry parents. Not one of the Emily Dickinson poems studied at my junior high or high school! A beautiful poem of real passion. Whomever she wrote it for - WOW - go Emily! It is interesting for those who have studied Emily Dickinson to really know who she wrote this poem about. There is a theory many of her poems were written on behalf of her secret relationship with her sister-in-law, Susan Dickinson.